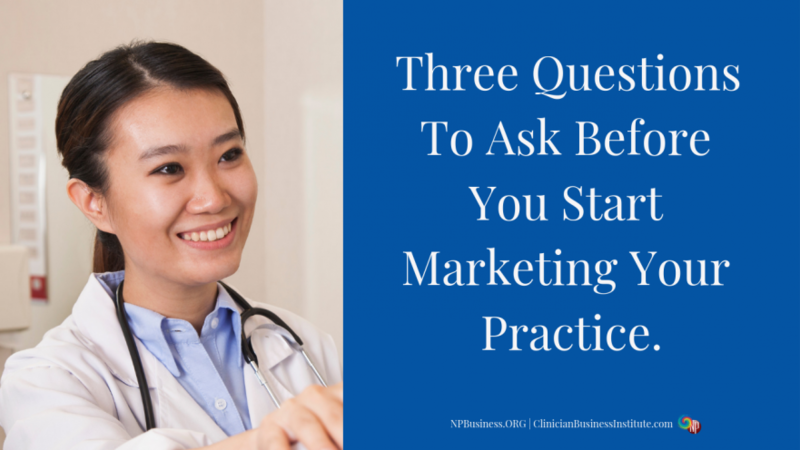 Business for Healthcare Providers Three Questions To Ask Before You Start Marketing Your Practice. The last article introduced you to the marketing framework. It’s a way of thinking about marketing that helps remove overwhelm and gets to the core of the matter. Effective marketing focuses on the customer, not the business. Marketing is an ongoing activity, not a onetime thing. Marketing does not need to be expensive to be effective. Frequently, small business owners (regardless of industry) believe they’ll win in business if they’re good at what they do. And even though it takes “being good at what you do,” they’re confusing the technical side of business with the business side. You see, there are countless small service businesses where the owner is competent, delivering excellent service. But that alone does not guarantee success. Success in business hinges on implementing strategies to market and sell your services. Unfortunately, that’s what’s uncomfortable for so many small service providers. This “discomfort” may be part of the reason why marketing doesn’t get the attention it deserves. And it doesn’t help that the professionals who dared to market their services in the past, didn’t earn a stellar reputation either. Perhaps that’s why for many small service businesses (including medical offices), marketing tends to be crisis-driven. Marketing jumps to “important” only once appointments have all but disappeared from the calendar. And that’s how it is with marketing. You want to create a marketing machine that keeps on going before your calendar runs dry! Who are my customers, my patients? Where are my customers and how I can reach them? What is my message to my customers? On the surface, this may seem like a silly question. But once you stop and think about it, it’s not silly at all. Because if you don’t know who your customers or patients are, how can you craft a marketing message that resonates with them? Think about it… what you say to the mother of a toddler is vastly different from what you would say to a teenager or a woman in her 90s. Now, I understand this may be easier if you own a specialty practice rather than a primary care office. But even if you own a primary care office, you too can create a patient profile to guide your marketing. What you may need to do is create a composite of your ideal patient or create not one, but a few ideal patient profiles of the people you typically see in your office. And this is what you’ll use to guide your marketing. Identifying your customers, those you’ll serve in your business is one of the most critical steps when designing your marketing. Without it, your marketing message will be weak and likely not resonate with anyone. Once you know who your customers are, it’s time to ask where they are. And I don’t mean where they live, shop, or work…. Remember, this is about marketing! You need to know how to get your marketing message in front of your customers. And to do that, it helps to know where they’re searching for information. Are they online or offline? Do they use both, online and offline? Do they turn to the web or the phonebook? Do they look at their newsfeed or newspaper? Are they on Instagram or Facebook? For example, if you’re working in geriatrics, this population may or may not go online for information. To reach them with your marketing message it might be best to utilize offline channels. Alternatively, you might use a combination of both online and offline. Compare this to working with mothers of young children. They go online to look for information and to interact with their peers. They’re online, and it wouldn’t make sense to place your ad in the local phone book to reach them. What you say in your marketing message matters! And that’s why it’s imperative you get to know your audience before crafting your message. Unlike old style messaging, your message today must be customer focused and benefit-driven, and not focus on the company or the owner. People still want to know who you are, the education and experience you bring to the table. But first and foremost, they want to know if and how you can help them. And that’s what you want to highlight in your marketing message. So, avoid corporate speak and tailor your marketing message to what your customers, your patients are looking for. To be successful in marketing, you must get the right message in front of the right people. But you can only do that once you know who your patients are and where you can find them.